The NinjaEye enables the visualization of your trade. Red markers indicate SELL, and blue markers indicate BUY respectively. Green dot lines indicate win trade, and red dot lines indicate lose trade respectively. Information of trade statistics is shown on the right top of a chart. Weekly notifications and/or mails are also possible. Good luck! NinjaEye has two buttons on the right top of chart. T button toggles show/hide of trade. i button toggles show/hide of information. NinjaEye occupies the right top of the chart so that using "Auto scroll" and "Chart shift" is recommended. UseLogFile - false: use only trade history. true: logging to a file and loading from the log file when inidicator is initialized. Open positions view function is added. Sell and buy positions are shown in red and blue arrows in default settings, respectively. 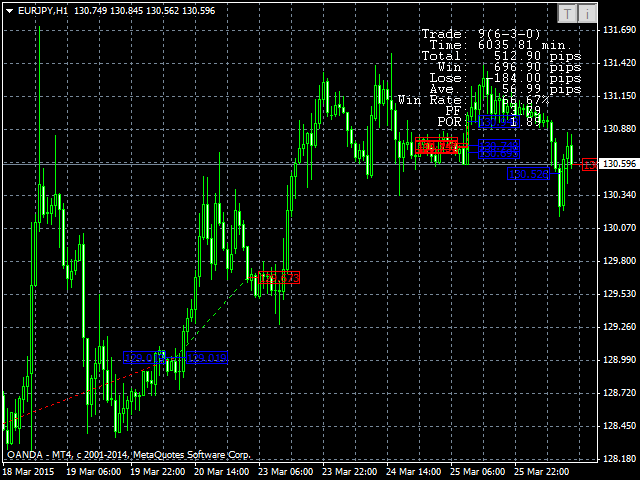 Arrow color can be changed in setting tab of indicator color.